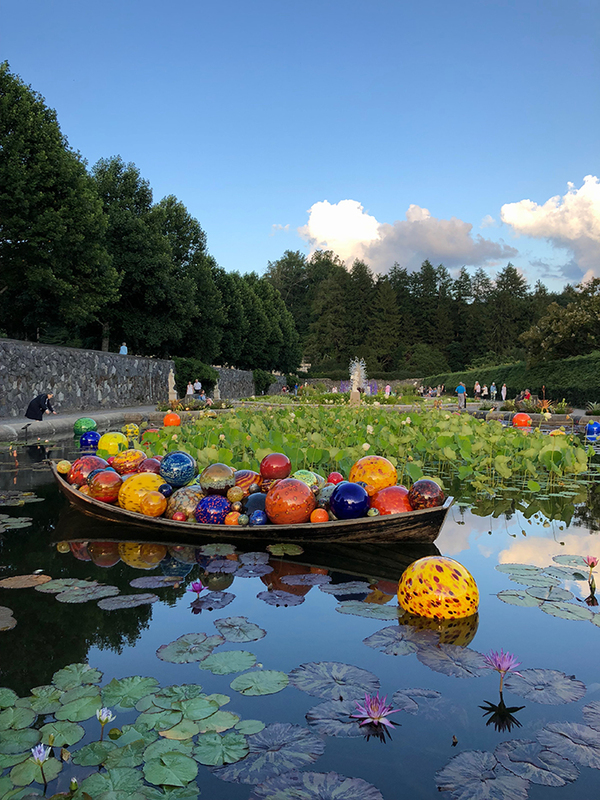 Asheville’s iconic Biltmore Estate, the largest privately owned home in the country, is hosting a stunning display of large-scale Dale Chihuly glass works for a limited time. 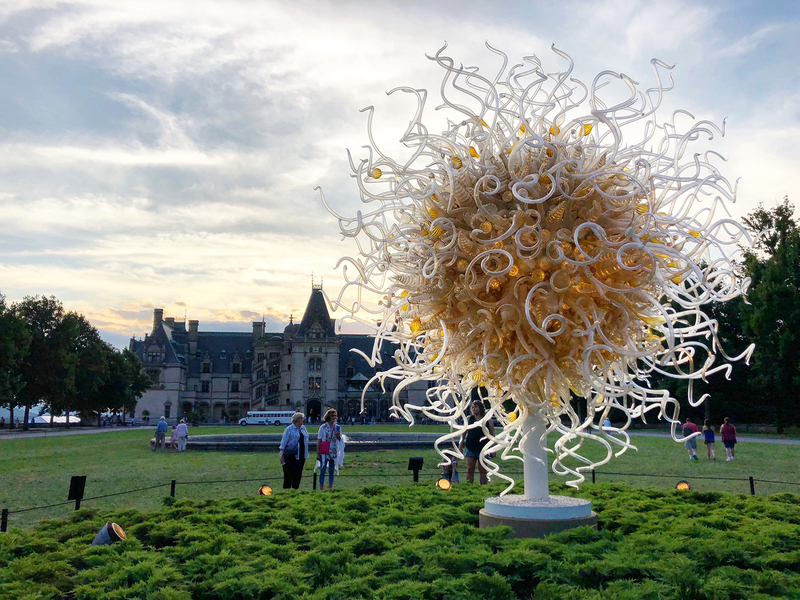 The groundbreaking art exhibit is the first ever held in Biltmore’s historic, perfectly manicured formal gardens — also making it the first Chihuly garden exhibition in the state. Charlotteans will recognize Chihuly’s style of impossibly delicate, intricate glass work from his eye-catching 2,200-pound Royal Blue Mint Chandelier that hangs in the entry to The Mint Museum Uptown. His art is displayed in 200+ museum collections and special exhibitions around the world. But Chihuly at Biltmore is on another level. The scale of this particular collection displayed at this one-of-a-kind landmark setting is unmatched, and it’s just two hours from Charlotte. Before you hit the road, check out the full Agenda Asheville Travel Guide to pack out your itinerary with more things to see, do and eat around town. 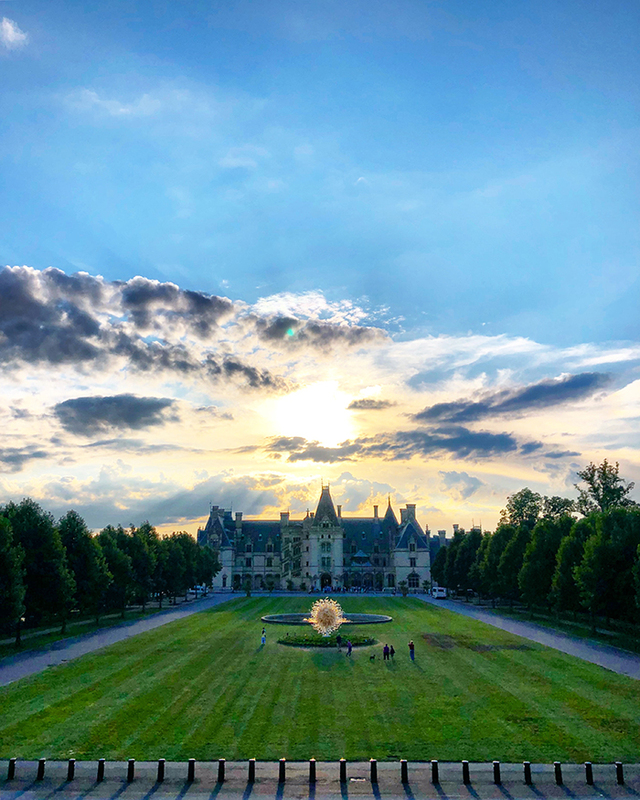 Follow us on Instagram for your chance to win a 2-night stay at the Village Hotel on Biltmore Estate and two daytime passes to Chihuly at Biltmore. Contest closes at 9 p.m. EDT Tuesday, July 31. There are three options for overnight accommodations on the Biltmore property — from casual to luxury. The Inn, an elegant 4-star hotel and spa, and The Cottage, a historic 2-bedroom/2-bathroom Vanderbilt-era estate home, are high end options. 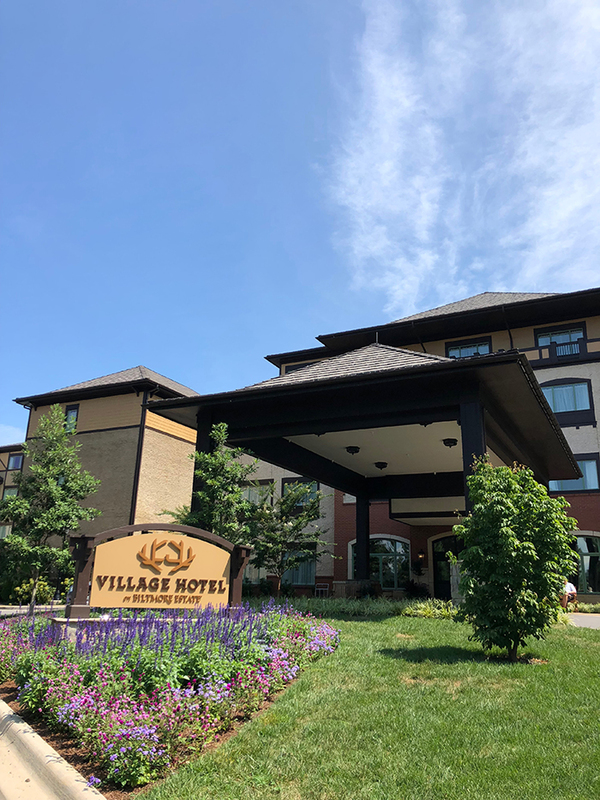 We stayed at the Village Hotel, a country-inspired 209-room property adjacent to the shops, restaurants and winery at Antler Hill Village. Hotel pricing is dynamic. Check reservation pages for updated pricing and availability. What about transportation? The Biltmore Estate is enormous (8,000 acres) and you can expect to travel at least a few miles between destinations on the property. Shuttle service is available for overnight guests to and from the Biltmore House, which is located 4-5 miles from the hotels. You’ll receive a white card when you check in that gets you access to the shuttles. 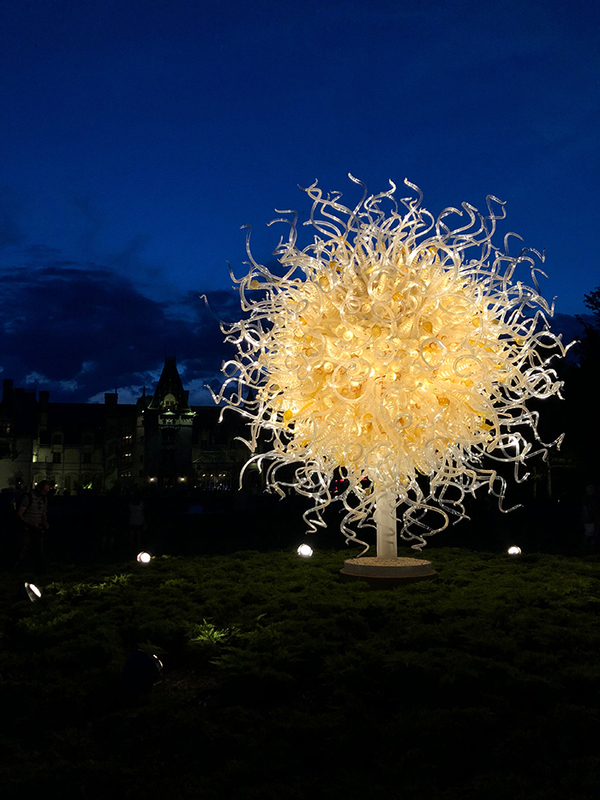 Chihuly at Biltmore has both daytime and nighttime ticket options. 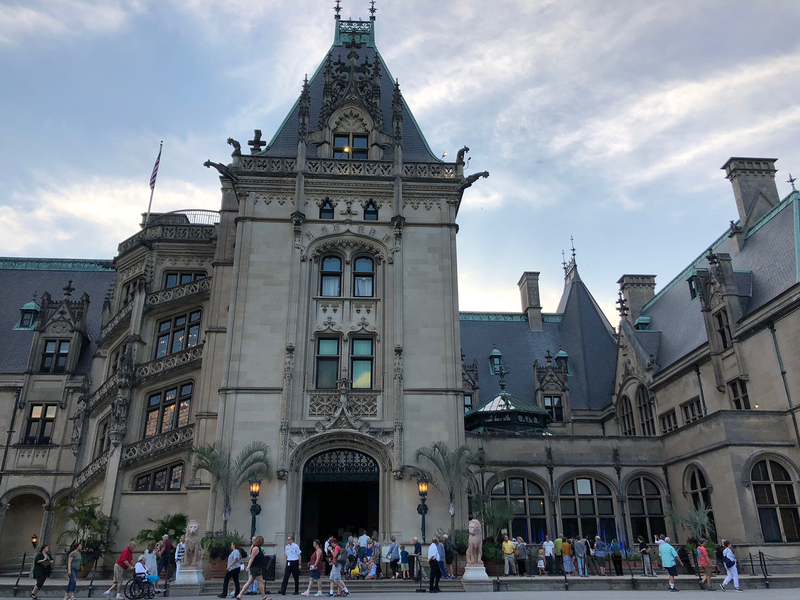 The biggest difference (other than time) is that the daytime ticket includes a full self-guided tour of the Biltmore House while the nighttime ticket only includes the first floor. Go with the nighttime ticket for the live music in the gardens, gorgeous sunset directly behind the house and illuminated Chihuly glass in the gardens. The nighttime ticket also includes daytime access to the gardens (same day or the following day) so you can catch the Chihuly exhibit both ways. 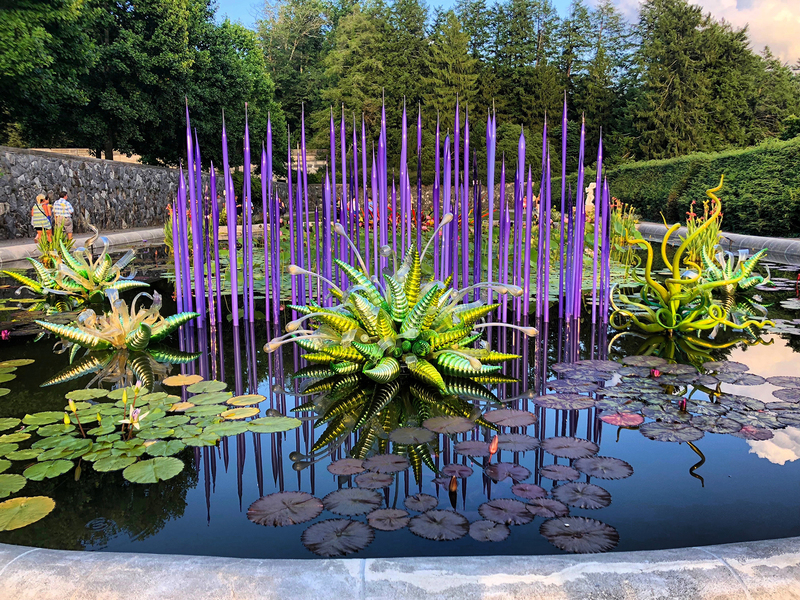 There are 16 Chihuly displays on the Biltmore estate, including two at the house and two across the grounds over at Antler Hill Village, but most are concentrated in the gardens immediately outside the house. The fragile, complex pieces took a team two weeks to install back in May. Sole d’Oro – The giant golden sun in front of the house is impossible to miss. Check it out up close and then head up the dramatic staircase directly opposite the house for an impressive view from the overlook. Float Boat – You’ll find a number of breathtaking water installations in the Italian Garden to the left of the house. “Float Boat,” a canoe filled with colorful blown glass orbs, is a showstopper. Electric Yellow and Deep Coral Tower – Just beyond the Italian Garden in the Conservatory are displays nestled among brightly colored flowers, including this huge red and yellow glass tower. Contest closes at 9 p.m. EDT Tuesday, July 31. See official rules.